The special forces guy would have been amused that I watched his feet when told of his background. We were golf partners. We’ve been putting one foot in front of the other since the beginning, at least our own beginning, and the feet have looser lips than the lips. The feet tell the truth about where we’ve been and where we’re going. A young relative of mine is showing some real athleticism so naturally I had to scout out his feet during a wedding reception. History is made through good footwork. Everything else is merely wedding cake. I was torn between naming this page turner blog either groundthumper or skyaisle and went with the latter because it sounded so much more hip than the real me with the attitude of a ground thumper. So I flunked the authenticity test right from the get go. The cloud is getting all the talk from the techie people but staying grounded is the most underrated of character traits. Unless you’re playing a water hole. 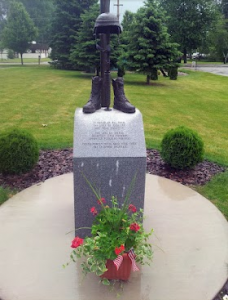 A toast should be made this Memorial Weekend to the felt boot that was sent to Russia through the Lend-Lease program. While the Germans suffered debilitating frostbite, Russian soldiers defended the Eastern Front thanks to the millions of felt boots with the USA label. That was my little history lesson for the day. I didn’t intend to take the picture of this memorial to Michigan soldiers who “made the ultimate sacrifice,” as it is written with the admonition to also never forget. Frankenmuth had a “dog bowl”. Sponsored by Purina, no less. The dogs of war weren’t entered, busy like our soldiers with a more important agenda. Bad weather cancels most everything but war and the NFL and I ran for cover in the Asics running shoes. I stopped when I saw this little memorial. Staying dry didn’t seem as important. After taking a picture, I jogged in the rain and stopped when I saw the Silent Night Chapel on the Bronner’s CHRISTmas Wonderland property. This chapel was built as a replica of the Silent Night Chapel in Austria. Inside the chapel are copies of the song in more than three hundred languages. I had never gone in, not paying much attention to it like I had ignored the little war memorial. I went inside and felt like I had intruded on an African-American family sitting quietly, pondering the meaning of “Silent Night” as it played softly over the beating of the rain and occasional thunder. They looked self-consciously over at me and said a curious “Hello.” I stood in the middle of the chapel, not sure what to do, and looked dumbly at them as the words of “Silent Night” drifted into the rain. I sat near the family and thought of Walter Cronkite’s ‘Silent Night” recital with the Mormon Tabernacle Choir. Ten million died in World War One, the Great War, as the historians call it. But the Christmas of that first year, British and Germans sang carols, including the heart wrenching words of “Silent Night.” No Man’s Land was filled with barbed wire and frozen corpses. A brief truce is negotiated but the young soldiers on both sides have already crossed No Man’s Land to greet the enemy they would resume killing with ferocity for three more years. At the end, ten million ground thumpers dead. Racial segregation created a No Man’s Land between whites and blacks here that was eventually crossed only after a terrible cost. The ground thumpers paid it with their blood. The course of history is shaped by footwork of the ground thumpers. The African-American family nodded to each other and said in a hush voice that they should go. I followed them into the rain.